South of N.H. Route 103 on Joppa Road spanning the Warner river in Warner. The bridge is 76'6" long with a clear span of 70'10". It has an overall width of 17'3" with a roadway width of 12'10", and a maximum vertical clearance of 10'10". It is posted for six tons. The structure was built by Joshua Sanborn. George Sawyer and Walter S. Davis built the abutments. Repairs were made to the bridge in 1871 at a cost of $134.81. In 1990, the state repaired the diagonal and the portal, and installed a new metal roof. There has been some debate as to the classification of the truss system. The Warner Historical Society in its 1974 publication, Warner N.H. 1880-1974, classified the bridge as a Haupt-type truss. the New Hampshire Department of Transportation indicates a classification of multiple Kingpost with an auxiliary Queenpost system. However, based on the National Register of Historic Places nomination form, it would appear to be classified as a Long truss with an auxiliary queenpost system. 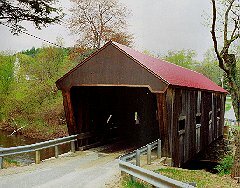 This is one of the oldest standing covered bridges in use today. It is also known as the Joppa Road Bridge. The bridge was rebuilt in 1963-1964. The rebuilding costs were shared by the town and the state. The Dalton Bridge is listed on the National Register of Historic Places.